It is a liquid chemical solution that is colorless in appearance. It is obtained by dissolution of ammonia in water. It is also known simply as Ammonia. The CAS number of the material is 1336-21-6. The EC number of the substance is 215-647-6. This chemical is colorless in appearance. It is very volatile in nature and bitter in smell. The chemical formula for Ammonium Hydroxide is NH4OH. Molar Mass – Its molecular weight is 35.05 g/mol. Solubility – It is miscible in water. Boiling point – Its b.p. hovers between 38°C and 100°C based on the concentration. Melting point – Its m.p is −57.5°C (25%). Density – Its density is 0.91 g/cm3 (25 %). Specific gravity – Its specific gravity actually depends on strength of the solution. It is typically 0.9. Auto-Ignition temperature – Its auto-ignition temperature is 651°C. Vapor pressure – Its v.p is 115 mm at 20°C. It is used as a cleaning agent in various commercial and industrial products, such as household ammonia. It is used as a general purpose cleaner for many surfaces such as stainless steel, porcelain, glass and also ovens. It is used in manufacturing rayon as well as other textiles. It is also used as a refrigerant. It is used as an additive to maintain the correct level of acidity in food items. It is also implemented in the production of detergents, soaps, ceramics, pharmaceuticals, inks and explosives. It is also used in the fireproofing of wood. This is a poisonous substance and can lead to toxic effects if inhaled or on coming in skin or eyes. Eye exposure – It can cause irritation in the eyes on exposure. It is non-corrosive to the eyes. However, spray mist or liquid form of this chemical can damage the tissues, especially on mucous membranes of the respiratory tract, mouth and the eyes. Concentrated ammonium hydroxide solution is highly damaging for the eyes. Inhalation – Accidental inhalation of Ammonium Hydroxide spray mist can lead to acute irritation of respiratory tract, characterized by choking, coughing or respiratory shortness. Prolonged or repeated exposure to the substance can lead to respiratory tract irritation that can result in frequent bronchial infection attacks. Long-time or repeated contact with spray mist can cause damage to specific organs and cause severe skin irritation and Chronic Eye Irritation. Repeated exposure to the material can lead to its accumulation in one or more human organs and lead to their general deterioration. Ingestion – If accidentally swallowed, the substance can cause extensive damage to the mucous membranes. 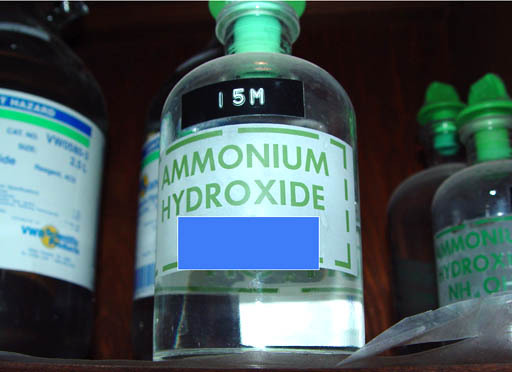 Ammonium Hydroxide can give rise to various health hazards. On exposure to this chemical, you should use these safety measures. Eye Contact – In case of accidental eye exposure, remove any contact lenses that you may be wearing. Flush the eyes immediately with running water for a minimum period of 15 minutes, keeping your eyelids open. You may use cold water for washing purposes. Rinse the eyes thoroughly with running water to prevent a possible infection. You should also immediately seek medical attention. Wash and clean lenses thoroughly before using them again. Skin Contact – In case of skin exposure, immediately remove contaminated shoes and clothes. Flush the affected area for at least 15 minutes with enough water. Use an emollient to cover the irritated region of the skin. Use cold water as hot water may increase irritation. Wash clothes and shoes thoroughly before reuse. Seek immediate medical attention. In case of severe skin contact, you should wash the affected region with a disinfectant soap of a soft brand. Apply an anti-bacterial cream over the contaminated skin area. Medical attention should be sought immediately. Inhalation – If the substance is inhaled accidentally, an affected person should immediately move to a fresh airy region. If the individual is not breathing, artificial respiration should be administered in the form of mouth-to-mouth resuscitation. In case of breathing difficulties, oxygen should be given. Medical care providers should be called immediately. However, mouth-to-mouth resuscitation can be hazardous to be used on people who are sufferers of toxic, corrosive or infectious material. It may cause problems in healthy individuals providing the resuscitation. In case of serious inhalation of this material, the victim should immediately be evacuated to a safe, uncontaminated area. Tight clothing accessories such as collars, belts, waistbands or ties should be loosened. Ingestion – If swallowed, tight clothing accessories should be loosened. Vomiting should not be induced unless directed to do so by a professional medical care provider. An unconscious victim of inhalation should never be given anything by mouth. Medical care should immediately be sought. The chemical should be store in tightly closed containers, which need to be kept in a cool, well-ventilated place. The temperature of the place of storage should not exceed 25°C (77°F). The containers should be dry and kept locked up. They should be kept away from incompatible substances such as acids and metals. In case of an actual poison exposure, you should ring up the National Poison Control Center at 1-800-222-1222 or your local emergency number (such as 911).